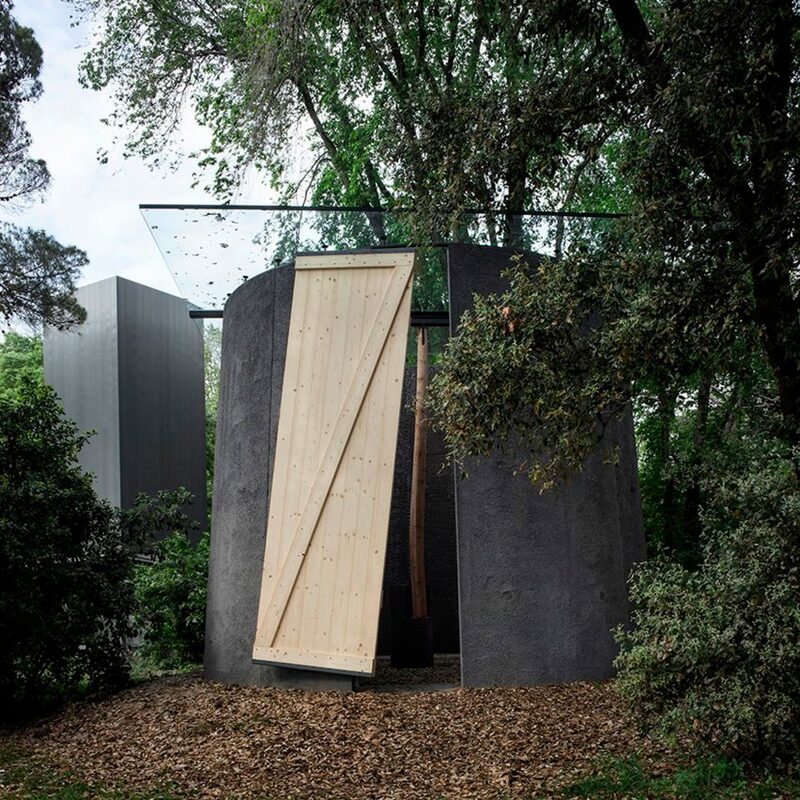 The Vatican City seeks to question the meaning of the chapel in the 21st century with its debut at the Venice Architecture Biennale, a series of woodland structures by famous architects from around the world. 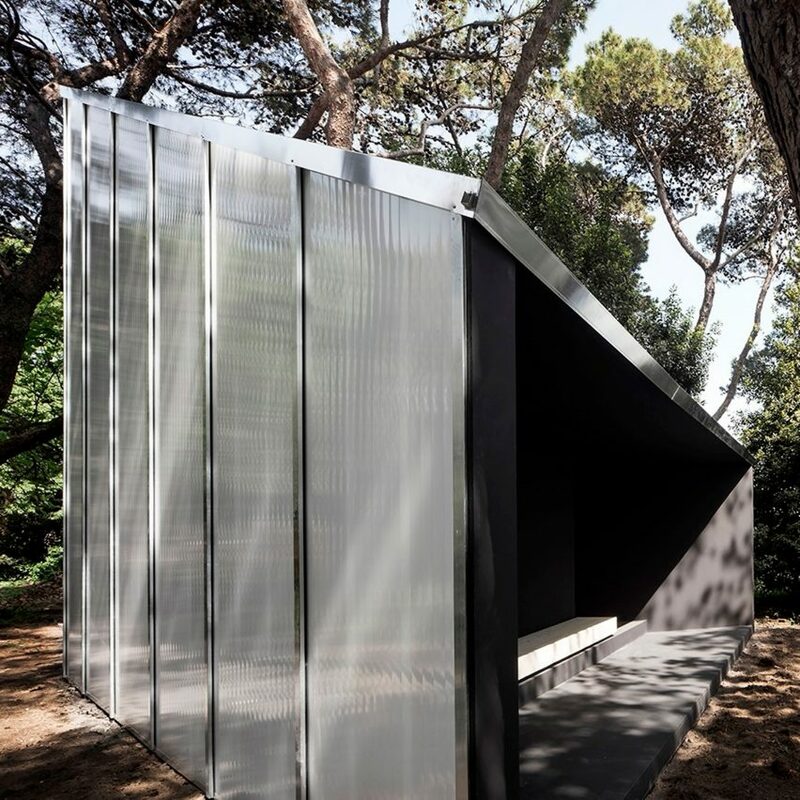 The Holy See Pavilion consists of 10 small chapels, built by architects including Norman Foster, Eduardo Souta de Moura, Sean Godsell and Terunobu Fujimoro. Curated by architectural historian Francesco Dal Co, the project explores how the chapel can exist as an isolated building, free from the attachments of specific religions or religious sites. “In our culture we are accustomed to seeing the chapel as a space created for different reasons and aims, inside a larger and often already existing religious space,” reads the curator’s description. 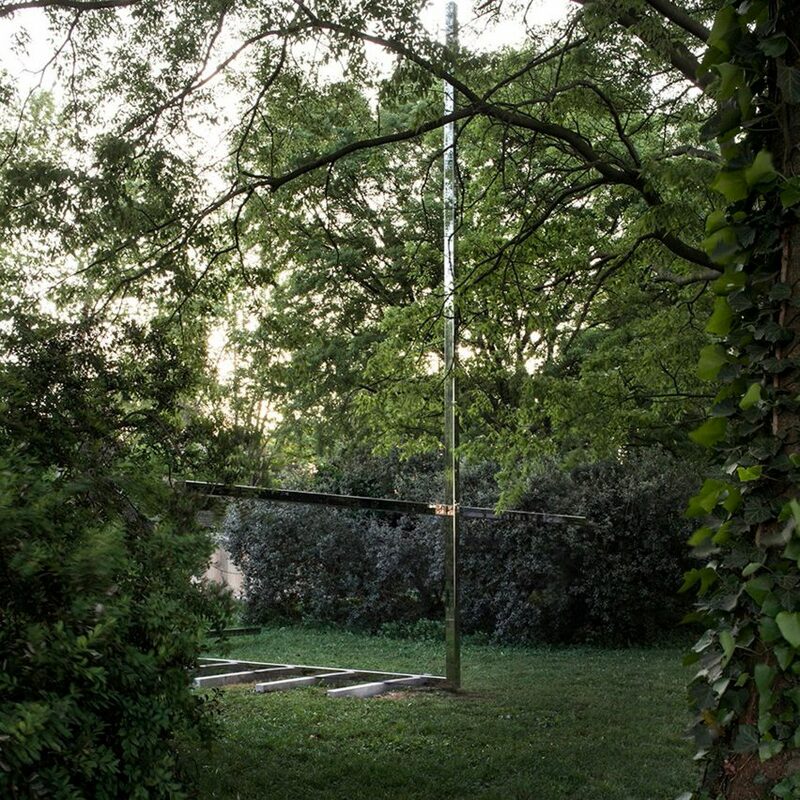 “The practice behind this perception has produced many models that share the factor of taking form in and belonging to an ‘other’ space, a space of worship, a cathedral, a church, or more simply a place identified for having hosted an unusual occurrence, selected as being a recognised destination,” it says. Standout chapels include a huge concrete cylinder with the texture of bubblewrap, by Chilean architect Smiljan Radić, and a terracotta-toned wall designed to channel the first sunlight of the day, by Spanish architects Ricardo Flores and Eva Prats. Other highlights include a sunken, stone “sanctuary” by Souta de Moura, a charred timber cabin by Fujimoro and a simple monochrome shed by New York-based Andrew Berman. 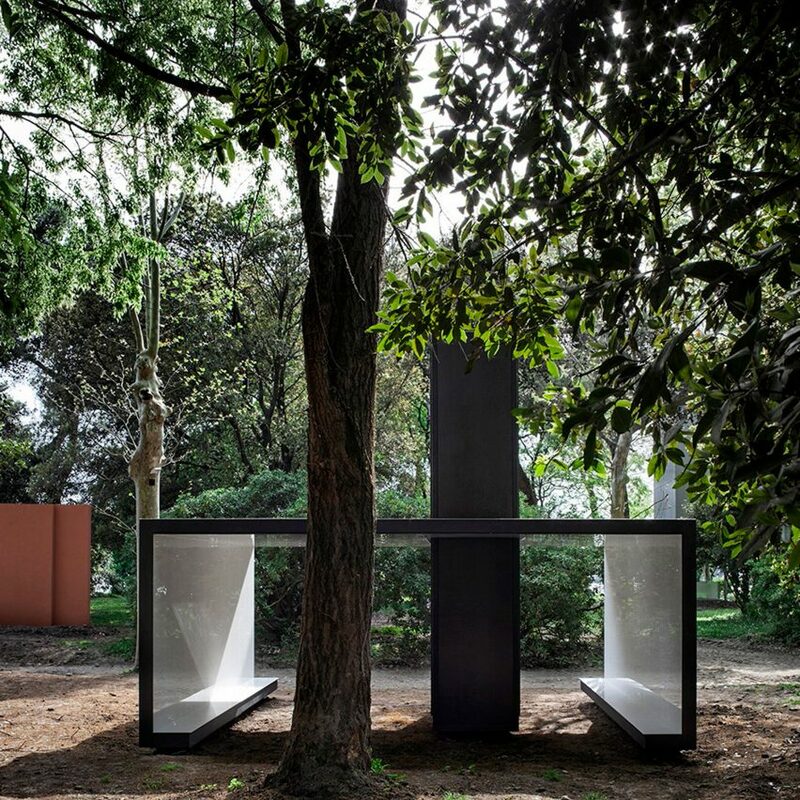 The 10 chapels are installed in a wooded area on the Venetian island of San Giorgio Maggiore. They are accompanied by an 11th pavilion that tells the story of a chapel built by Swedish architect Gunnar Asplund in Stockholm in 1920, which was the starting point for the project. 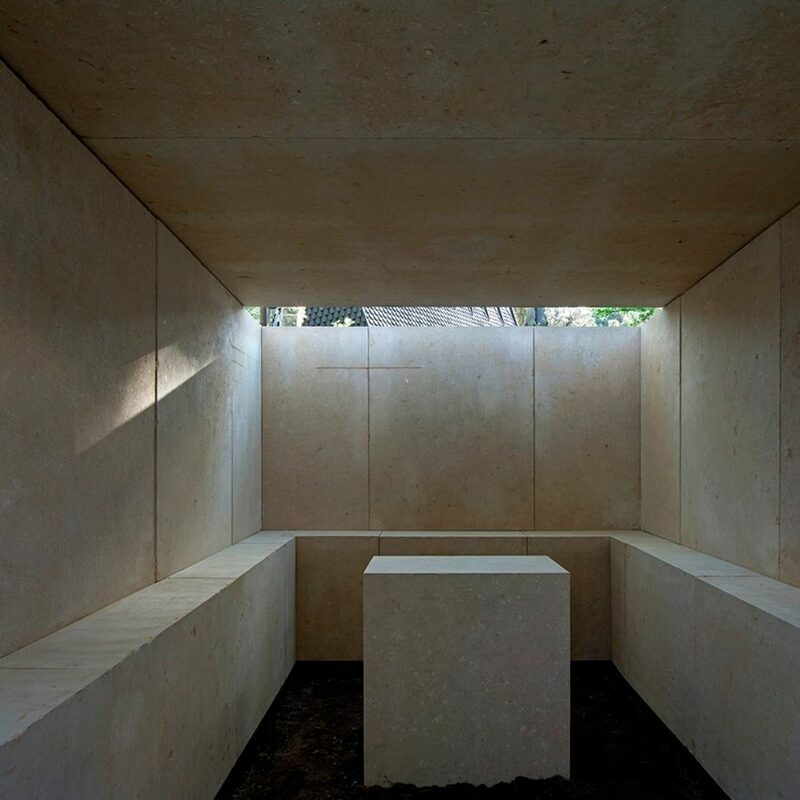 Thick stone walls frame this slightly sunken chapel designed by Portuguese architect Eduardo Souto de Moura, who is also one of the Golden Lion winners of this year’s biennale. A ledge around the sides creates a place for visitors to sit, while a stone at one end can function as an alter. The founders of Spanish studio Flores & Prats have created an oversized wall, punctured by an angular doorway and a large arched platform. 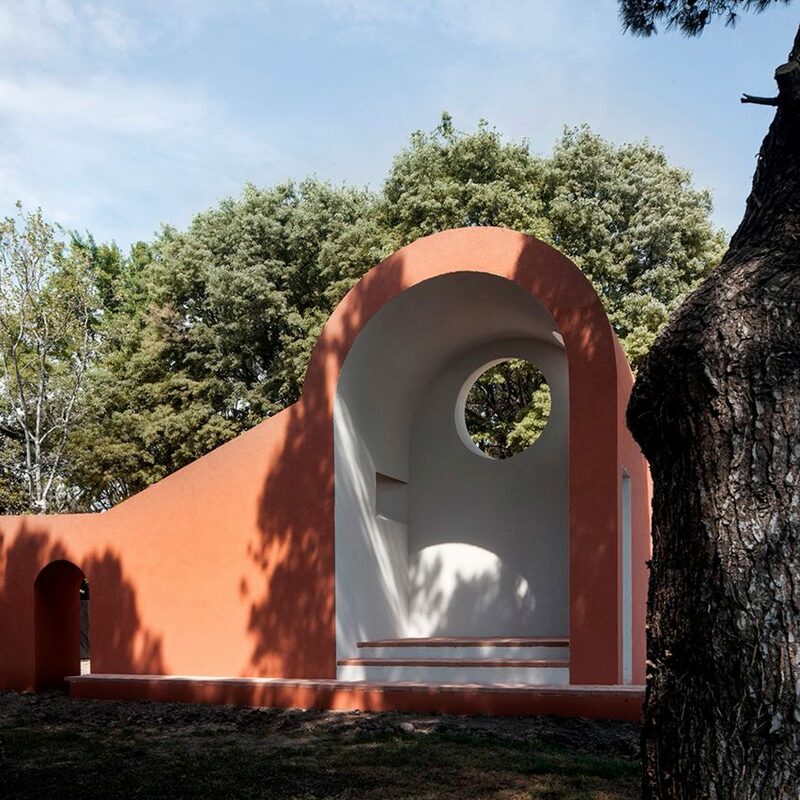 Called The Morning Chapel, the terracotta-toned structure features a high-level window that is aligned to channel the first sunlight of the day down to the altar. 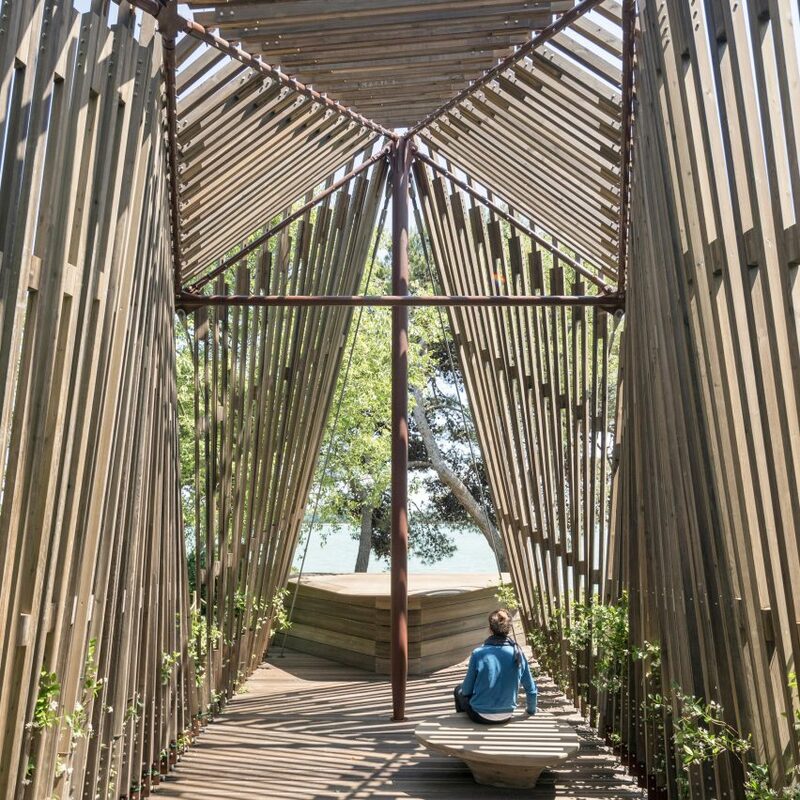 The founder of Foster + Partners designed a chapel made from slender timber beams, supported by a minimal structure of steel columns and cables, and covered in jasmine vines. At one end, visitors are treated to a framed view out to sea. “Our aim was to create a small space diffused with dappled shade and removed from the normality of passersby, focused instead on the water and sky beyond – a sanctuary,” said Foster. Roadside shrines in Chile provide the inspiration for this unusual structure. Its dark concrete walls were cast against bubblewrap, creating a honeycomb-like texture inside. The building also features a huge wooden door that is hung at an angle and pivots open, creating an unusual overhang with the exterior wall. Tree trunks roughly sliced into square profiles create an informal colonnade at the entrance to this cabin-like chapel by Japan-based Fujimoro. The building has an exterior of charred timber, while inside it features a shingle floor surface and a wall speckled with flecks of charcoal. 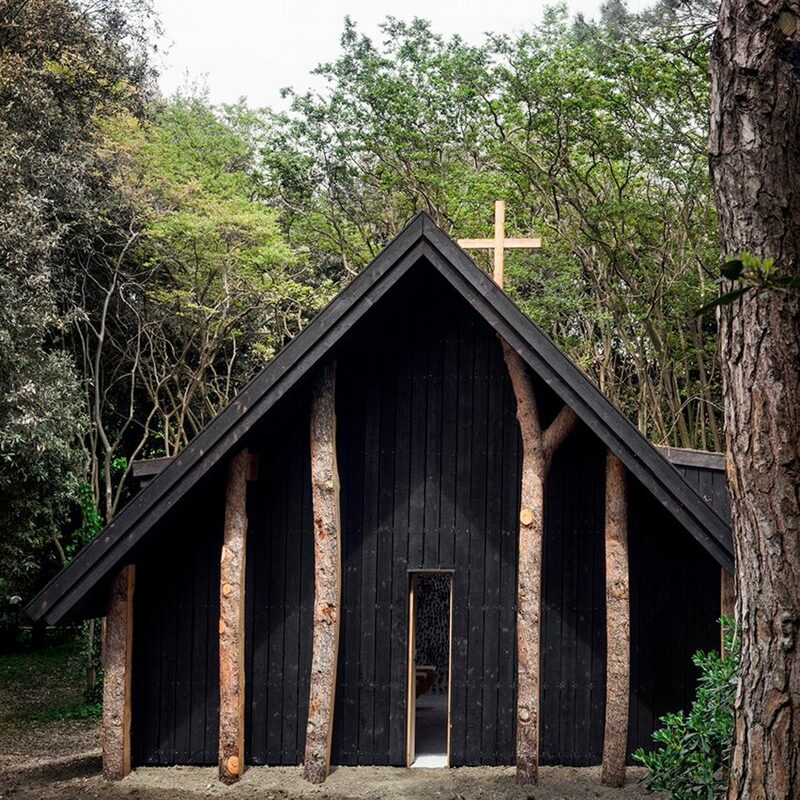 This simple chapel is designed to show how a humble shed can be a spiritual place. Built from lightweight wooden components and translucent polycarbonate, the monochrome structure features a grand porch at its entrance. At the rear of the black-painted interior, a single seat is set below a skylight, highlighting the contrast between light and shadow. Australian architect Godsell created his chapel as a dynamic structure, able to reveal or conceal its contents, through the use of large moving flaps on each of its four sides. When standing underneath the structure, visitors are offered a view of the sky framed by the tower’s shimmering gold internal walls. 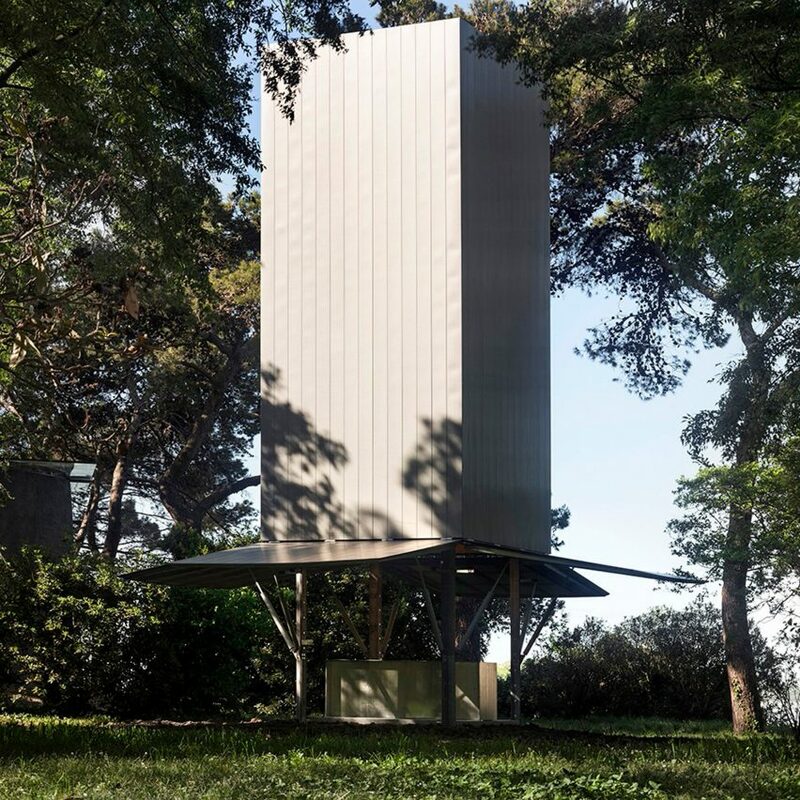 The simplest chapel of the group, this design by Brazilian architect Juaçaba is made from just four steels rods, each with mirrored surfaces. Together, they form a cross and a bench seat. The structure is slightly raised off the ground on concrete supports, to allow it to cast a bigger shadow. This chapel by Italian architect Cellini is made from two intersecting volumes, made up of black and white planes that fold to form seats and surfaces. 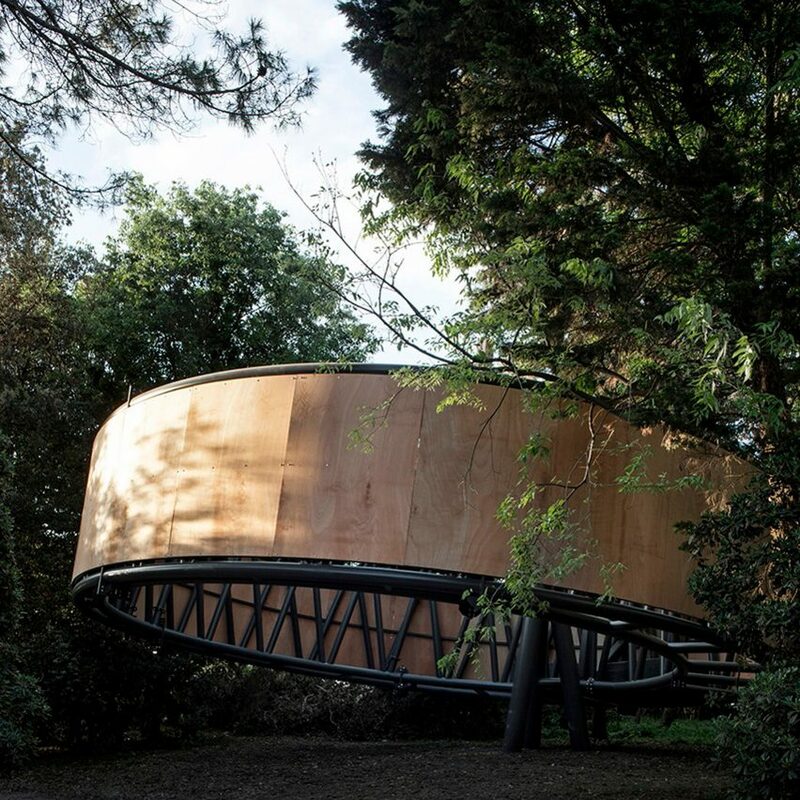 The structure is designed to look like it barely touches the ground. A huge cross section of a cylinder is lifted off the ground at an angle to form this chapel by Paraguayan architect Corvalán. Although it only meets the ground at one point, it creates a clear enclosure. Inside, visitors can look up to see a three-dimensional cross suspended among the overhanging tree branches.